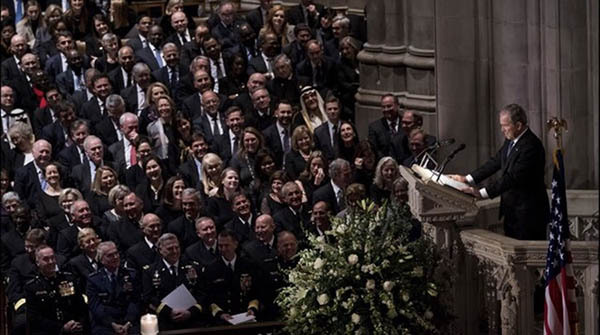 The Charge D’ Affaires, participated in the state funeral of former US President George H.W. Bush at the Washington National Cathedral on 5th December 2018. On 3rd December 2018, he attended a special ceremony at the Capitol Rotunda in Washington DC and together with members of the diplomatic corps to paid his respects to the former US President whose remains laid in state at the Capitol from 3rd to 5th December 2018. The Charge d’ Affaires also signed the Book of Condolence on 03rd December 2018 at the US State Department in Washington DC. In a brief message, he, on behalf of the President, Government and people of Sri Lanka, conveyed his deepest condolences to the Government and people of the United States of America on the passing of former President Bush. The National Flag of Sri Lanka was flown at half mast at the Embassy of Sri Lanka in Washington DC as a mark of respect to the late US President.